1. Koreans love English (even if they don’t always know what it means)! Despite being unable to find a lick of English translations, whenever I need it, Koreans actually think English words are cool. 2. 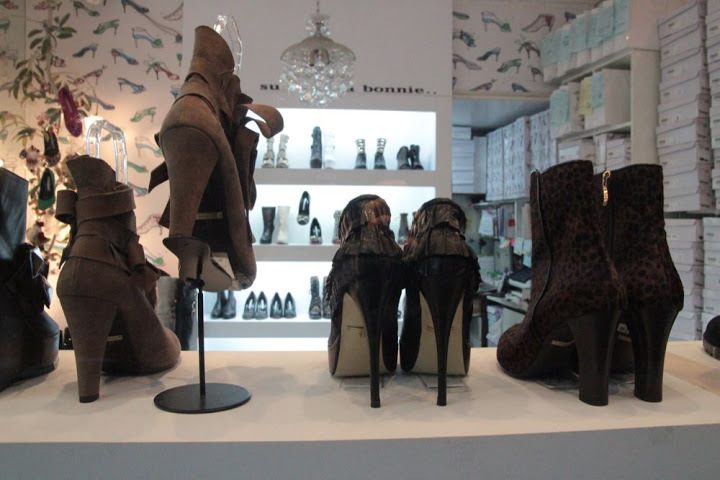 Korean women can do anything in high heels. Okay, maybe this is going to be a mild exaggeration… but Koreans have some unique ticks when it comes to certain types of weather. Rain… Umbrellas come out at the slightest bit of precipitation. I was shopping in Bandwoldang’s outdoor plaza and it began to drizzle (no, it was barely a drizzle…); immediately, umbrellas surfaced out of the blue and almost everyone had one! 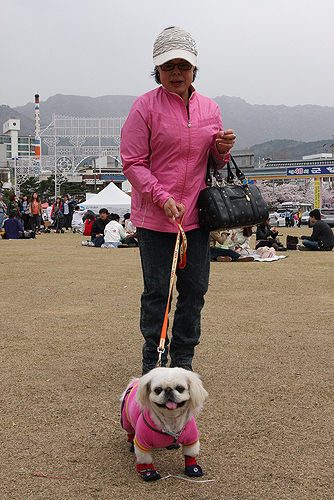 The only folk walking in the drizzle without umbrellas were foreigners. Hence, Koreans don’t like to get wet. Heat… When the summer swamp hits, most folk sweat it out or fan themselves with a hand or piece of paper. Koreans however, are always smartly prepared to battle summer heat– a paper fan in the purse is as common as a lipstick or a compact! Note: Even my elementary students bring them to class. Sun… Westerners worship the sun-god and will go to lengths to get a tan during the summer. But TAN is the least popular color in Korea. Pale and ivory skin is very vogue and is a highly prized status. 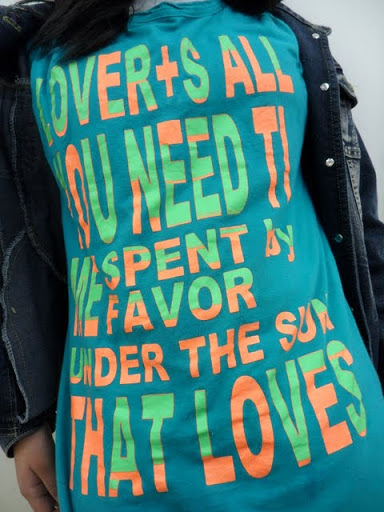 Stores sell arm protectors to keep you from getting t-shirt tans and older women either carry umbrellas for shade or wear hats with abnormally large visors, which extend at least 8-10″ out. Umbrellas aren’t only for rain. 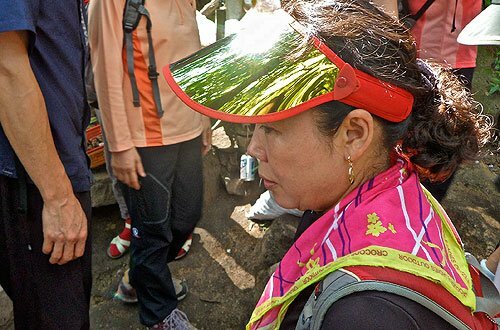 Ajumma wears the common ajumma visor. 4. Koreans let man(nequin)s do the work! Watch out for that man! Or is it? 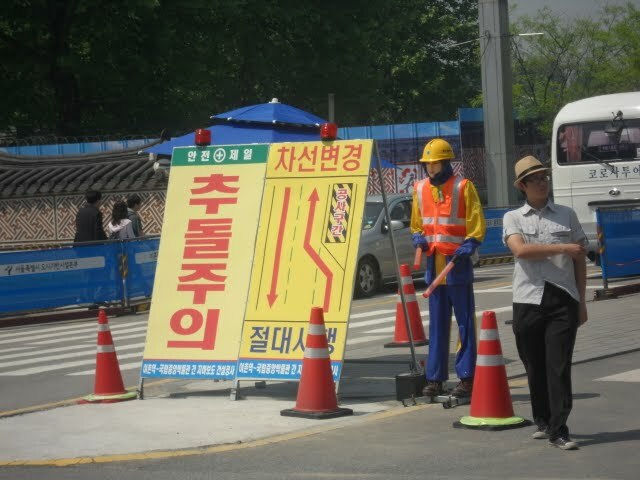 Koreans employ mannequins to do their road work. Instead of wasting an able-bodied human waving a caution flag towards oncoming traffic, they’ve smartly substituted mechanical men to do the task. Gotta love modern technology in Korea. 5. Incentive shopping and… freebies, freebies, freebies! 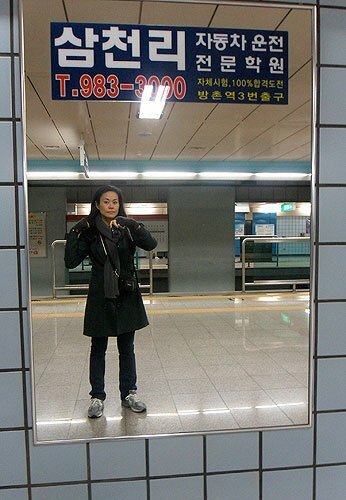 When my mom visited Seoul, one of her fun excursions was visiting the skin care shops of Myeongdong. Does my mom love shopping? No. Is she concerned with skin care? Not in the least. 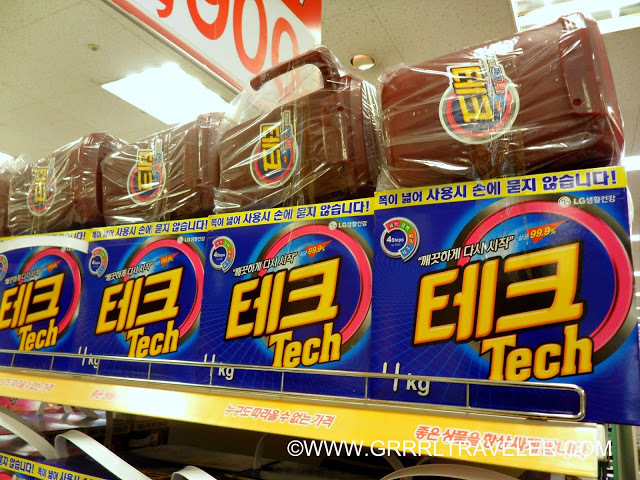 Shopping in Korea is like going trick-or-treating! The idea has to do with the jeonsu or gift giving. Much like the concept of panchan at meals, Korea gives shoppers a lot of incentives to buy. A promotion girl stands outside the store to lure shoppers in with freebies. 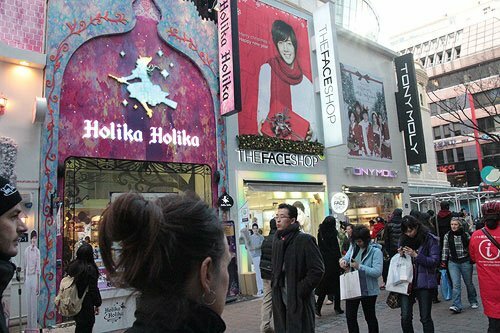 Koreans reward their shoppers’ time and loyalty. From beauty product promotions to groceries, household items to food vendors… everyone will “kick in a little extra something” to renumerate your visit or purchase. I bought one Cosmo magazine; the rest came with the package! Buy laundry detergent and you get a free garbage pail! Americans invented television but Koreans seem to use them more, watching it when and where they can. Everyone from the local dry cleaner, kimbap restaurants and taxi drivers seem fixated on the TV at all hours of the work day. 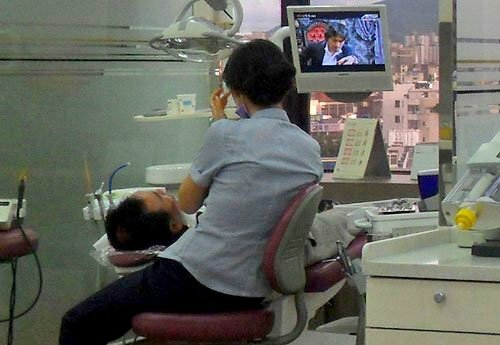 Moreover, everything seems to have a TV on it– from the Car GPS to mobile phones to the express buses… even my chair at the dentist’s office! 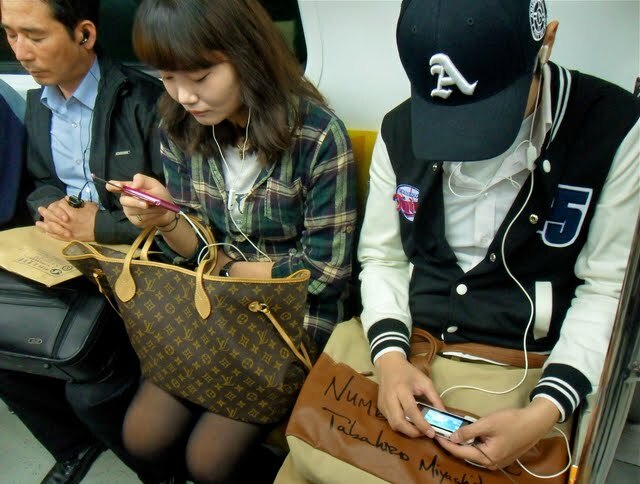 A favorite metro past time: a row of Seoul metro-ites & all of them are glued to their cellphone TVs. 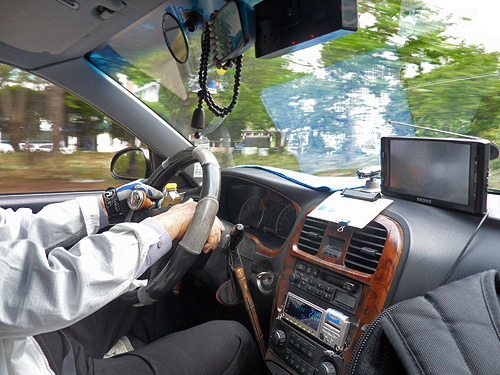 GPS devices have TVs: taxi drivers have perfected the art of TV watching & driving. 7. Koreans are the best-dressed fashionistas of the world. As I mentioned in an earlier post, Korea has to be the best-dressed country in the world. It’s no exaggeration, because you won’t find a sloppy Korean anywhere!. They really make an effort to be well-groomed fashionistas! It’s as if everyone’s stepped straight out of a clothing catalogue. The dress code is always form-fitted, wrinkle-free and seemingly… brand new (more here). (Above & below) Torn jeans and jogging shoes for hiking? Nope. 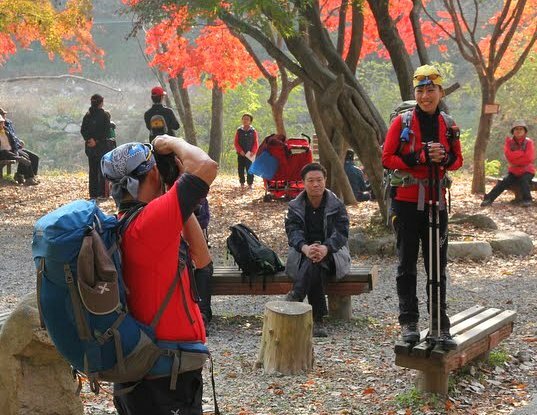 This is the signature style of Korean hikers; hiking could be a professional sport. 8. 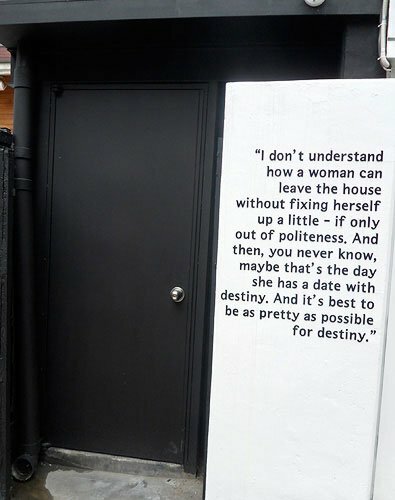 Koreans believe beauty is skin deep. Young to old, rich to poor, finding a grungy-looking or “ugly” Korean is like searching for a needle in a haystack! The country’s obsession with appearances and its pressure to “look good”, stems from the belief it’ll gain you a good job and higher status in society. A mole or beauty mark on your face is as good as a blemish or wort and you won’t find many old folk with white hair as long as hair dye exists! If you have any of these imperfections, your Korean chingu (aka friend) will gladly point it out for you so you can find the nearest dermatologist to correct it. To them, this is not mean-spirited or rude, but a goodwill gesture that’s as sincere and helpful as someone pointing out when you have spinach in your teeth. It’s a country with mirrors posted in public places, cosmetic surgery ads posted in subways and hair salons regularly occupied. Koreans are a beautiful race, but whether it’s owed to great genes or the hands of a great surgeon; it’s sometimes, hard to tell. 9. Koreans have more public places to squat, than to dump their trash. 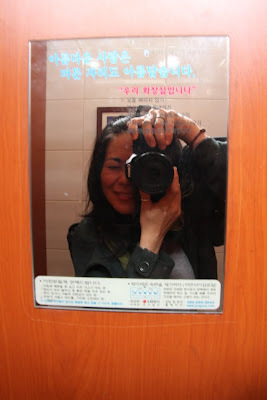 Finding a clean public restroom is a challenge in any city; the exception being Korea. God love Korean public restrooms! Whenever I have to find relief, its never a problem. Hiking trails, metros, bus stations, you name it… toilets are everywhere and most are regularly maintained by hard-scrubbing ajummas! The real enigma … is where to put your trash. Oddly, public littering is not an issue in Korea, but whenever I need a trash bin, they’re never to be found. The corner of cross walks, in shopping plazas, at parks or inside subway stations, etc… nada! Whether Koreans stash their trash in their pockets and purses or if they just don’t make any, is still a mystery to me. If anyone knows the secret to where the public trash cans are, please tell me. 10. Koreans are afraid of CCTV! Where crime is concerned, Korea’s got to be one of the safest countries in the world. How they control crime is through the fear and shame of being caught on CCTV. CCTV signs are plastered all over things– at schools, neighborhood areas, apartment buildings, stores, subways, highways…. they’re literally everywhere and they stand as a friendly, but foreboding reminder that Big Brother is watching your every move. And if you don’t do good, you and your family will feel the wrath of shame. 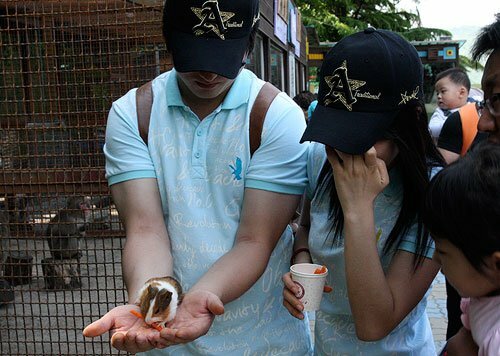 Unlike Western culture, family shame in Korea is not something Koreans take lightly. Yup. I was staying at a hotel and lost my passport. I inquired at the desk in a panic. The front desk gladly called to the security department to check the CCTV (the day that I arrived). In fifteen minutes, an answer came back that “the front desk had returned it to me, I put it in my bag and went up to my room”. I checked my room again and it found it had fallen behind a dresser! CCTV is no false threat. 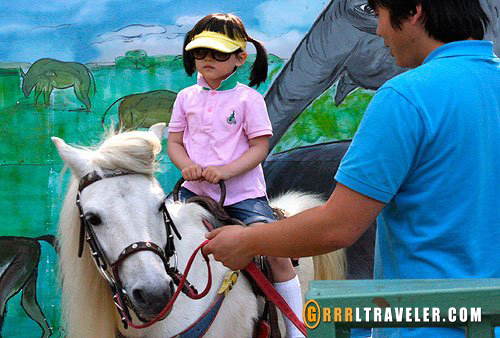 Any fun Korean quirks you’ve noticed? 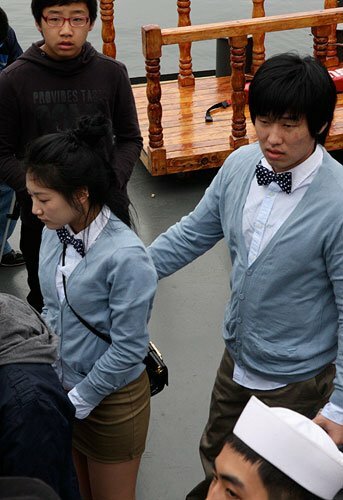 First,In korea, there r weirdos. some of these are not true!! Umbrellas aren’t only for rain. 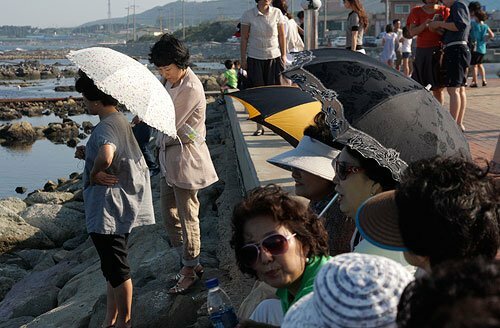 Ajumma wears the common ajumma visor. Myeongdong Shopping area, Seoul. A promotion girl stands outside the store to lure shoppers in with freebies. Another magazine purchase came with a box of free underwear Buy laundry detergent and you get a free garbage pail!